Package Online-Multilingual-2014 file - Contract J.A.C.K. 2. GUI  ( English - German - French - Russian ) for Contract J.A.C.K. 3. No-CD  for Contract J.A.C.K. 1. Package_Online ver1.1 (for Contract J.A.C.K., NOLF). Recover game online after switching off the master servers GameSpy in July 2014. Redirect your game from  the master servers GameSpy (disabled now) on master servers Qtracker. because after liquidation Sierra and the collapse of the master-server GameSpy key validity is not checked. In this case, you need to edit the file “hosts”  in the folder C:\Windows\System32\drivers\etc  on their own. The system Window 7/8/10  prohibits editing the file “hosts” in the system folder. 2. Multilingual package(English, German, Russian(2), French). Only for Contract J.A.C.K. version 1.1. Lithtech.exe (Lithtech it is No-CD) on game folder. 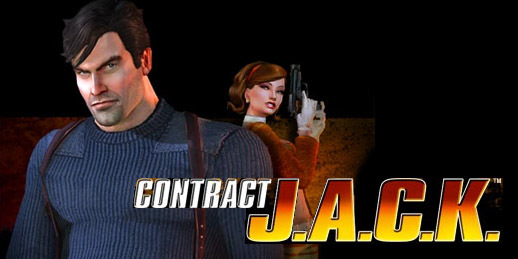 Before installing the package, you need to install the game Contract J.A.C.K. If you see graphics distortion in the game, then press the "Win" on the keyboard. The game will be compressed. Then click on the icon of the compressed game. The game will be restored without distortion graphics. prohibits editing the file “hosts” in the system folder.